Dry Ice: Do not handle dry ice with bare hands. Use neoprene or leather gloves. Discard remaining dry ice and cooler outside of the home. Loaded Potato Skins- Keep this product frozen until its intended use. Preheat oven to 450 F. Place frozen potato skins on baking sheet and bake for 17 minutes. Let stand for 1-2 minutes before serving. BBQ Ribs- Keep frozen until ready to prepare, place item in the refrigerator the day before you plan on using. You can bake the ribs at 375 F for 30-40 minutes wrapped in foil. You can also grill this item for 15-20 minutes wrapped in foil. Uncooked Pork Ribs- Cook at 300-375 F for 1.5-2.5 hours until they are cooked evenly throughout. Steaks, Burgers, Sausages, Hams, Pork, Veal, Poultry, Bacon, Scrapple, Deli meats, Turkey Burgers- Meats should be kept in the freezer until they are ready to be used. They can be kept in the refrigerator if they are going to be used within 1 day of arrival. Let steaks thaw the night before use in your refrigerator. Remove meats from vacuum sealed bags and allow meat to sit at room temperature for 30 minutes prior to serving. This will allow meat to return some of its color. Please note in some instances the meet will not return completely to its full natural color as this has to do with the lack of oxygen in the pores of the meat. The meat is still good and can be served. Beef Sticks, Ring Bologna, Sweet Bologna, and Jerky- Beef sticks and Jerky can be kept in the refrigerator for up to 10 days, any longer and they should be frozen. These items are already cooked and do not need any further preparation. Smoked Hams- Should be kept refrigerated until served for up to 4 days. If you wish to keep your product longer, you should put it in the freezer. It can stay in the freezer for up to 6 months. Vegetables- Microwave vegetables white side up for 3-4.5 minutes, let stand for 1 minute and serve. Apple Turnovers- They should be kept frozen until use. To prepare they should be baked at 350 F for 11-15 minutes. Coconut Shrimp, Breaded Shrimp- In a conventional oven preheat oven to 425 F. Place shrimp single layer on baking sheet. Bake uncovered for 12 minutes, turn product over and bake for 6 more minutes. For extra crunchy shrimp bake for an additional 1-2 minutes. Lobster Ravioli- Place ravioli in pot of water, bring water to a boil, and cook ravioli’s for about 6 minutes. You can also bake the ravioli in sauce for about 45 minutes at 350 F.
Steamed Crabs- To reheat crabs bring your pot to a steam then add crabs for 4-7 minutes. You want to use a rack to keep the crabs above water level. DO NOT TRY TO BAKE CRABS IN OVEN. You may want to add additional seasoning for extra flavor. Caution: do not over steam crabs to avoid drying them out. Blue crabs can also be reheated in the microwave 6-8 crabs for 1-2 minutes. Times can vary depending on the microwave; claws can be reheated the same way. Steamed crabs can be kept in the refrigerator in a sealed bag upside down. They should not be placed in the refrigerator while crabs are still warm, only at room temperature. Crabs should be used within 2-3 days to ensure freshness. Blue Crab Claws- Should be kept refrigerated for no more than 2 days until you desire to use them. It is best to eat them cold but if you desire to eat them warm microwave for 1-2 minutes. Live Crabs- Dozens should be steamed for 16-19 minutes. Half Bushels should be steamed for 19-24 minutes. Bushels should be steamed for 24-28 minutes. All steam times are averages and can vary depending on the amount of steam and the size of the pot. LIVE CRABS SHOULD BE STEAMED IMMEDIATELY UPON ARRIVAL. Crab Meat- Crab meat should always be kept refrigerated for no more than two days until you desire to use it. It is best to eat cold but if you desire to eat them warm microwave for 1-2 minutes. Sea Scallops- Our fresh scallops are able to be stored in the refrigerator for approximately 2-3 days, if you desire to keep them longer they can be frozen. Scallops can be baked, broiled, sautéed, or fried. In baking, broiling or sautéing scallops will turn from a translucent color to a pure white color when they are ready to be served. To fry scallops they should be dipped in milk or an egg-cream mixture then dipped in bread crumbs, and fried until bread crumbs turn golden brown. Oysters- Fresh shucked oysters should be refrigerated as soon as receiving and used by the date on container. Live oysters should be stored uncovered, kept in the refrigerator on ice and used as soon as possible. OYSTERS THAT ARE OPENED SHOULD NOT BE CONSUMED. Live Clams- Live clams should be cooked within 24 hours of receiving. Clams should be stored in your refrigerator uncovered; additionally they can be covered with a damp rag. DO NOT COOK CLAMS WHOSE SHELLS ARE OPENED. Clams should be steamed for approximately 3-7 minutes or until they open. Mussels- To ensure safe shipping and handling mussels are precooked and shipped. They can be microwaved for 1-2 minutes or re steamed for 2 minutes to warm up. If the mussels are open or closed they are fine as they are precooked. Soups- Soups should be used within 2-3 days of receiving. Soups should be kept in the refrigerator until use. Soups are best heated in a saucepan on the stove. Lobster Rolls- First start by thawing the lobster meat in the fridge for 4-6 hours. Next you want to toast your roll until golden brown. (Buttering the roll is optional but preferred.) The lobster meat can be added cold or microwaved for 20 seconds. 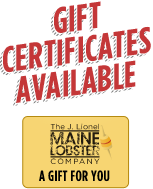 Whole Maine Lobsters- Steamed lobsters should be kept in the refrigerator for no more then 1-2 days. Steamed lobsters should be microwaved for 1-2 minutes to warm back up. They can be frozen to extend use beyond two days but freezing the lobster will take away some of the taste. Lobster tails- Lobster tails should be kept frozen until you are ready to use them. Before thawing the tails the vacuum packaging should be removed. You can thaw frozen lobster tails by placing them in the refrigerator a day prior to cooking. To quickly thaw the tails they may be placed in a plastic container with warm water. Cut the top of the shell of your tail using a pair of kitchen scissors. Pull the tail out of the shell so half of the tail is above the shell. Lightly cover the tail in melted butter and bake at 400 F for approximately 15-35 minutes or until meat has reached a nice white color. Larger size tails may need additional cooking time, and may need to be cut down the middle to allow the tail to cook evenly, an additional application of butter may be needed. Crab cakes, Shrimp cakes, Salmon cakes, and Lobster cakes- All cakes should be placed on a nonstick oven sheet for 20-25 minutes at 350 F or until golden brown. Crab cakes can be lightly covered with melted butter during cooking for optimal baking. Crab cakes should be stored in the refrigerator for no more then 1-2 days. For longer storage, crab cakes can be stored in the freezer. Crab cakes can remain in the freezer for up to 6 months. Shrimp- Raw shrimp can be stored in the refrigerator on ice for up to 2-3 days. Shrimp should be steamed for 3-5 minutes. Steamed shrimp is best eaten cold but can be microwaved for 2-3 minutes. King crab, Snow crab, Dungeness crab, and Stone crab- Crab legs should be stored in the freezer until you are ready to cook them. Crab legs should be steamed for 5-6 minutes depending on quantity and amount of steam. If you do not have a steam pot available, crab legs can be boiled for 5 minutes. Soft Shell Crabs- Soft crabs can be kept in the refrigerator for 3-4 days. Any longer length of time they should be stored in the freezer. Soft crabs can be sautéed in a pan at medium heat with garlic butter until red develops on the shell and the underside develops a slightly golden color. It is optional to bread the soft shells prior to cooking. The crabs can be dipped in a mixture of egg and cream or milk, and then placed in a batter mix of your choice. Depending on the time of year soft shell crabs may or may not be cleaned. If you must clean them cut strait across their front to remove the eyes and mouth, cut the flap off on the underside of the soft crab, and finally fold each corner of shell in and cut off the lungs. Fish- Fish should be used within 2-3 days of arrival. It should be kept on ice in the refrigerator. Fish can be baked in the oven at 350 F until the fish has an even color throughout. Fish can also be breaded and pan fried until entire fish has an even color. Alligator, Frog legs- These items can be grilled in aluminum foil and butter for about 10-15 minutes or until they have a nice even cooked color throughout. They can also be pan fried in garlic butter or oil with a little milk for about 10 minutes or until cooked throughout. WARNING: CONSUMING RAW OR UNDER COOKED FOODS GREATLY INCREASES YOUR RISK OF FOOD BORNE ILLNESS. Note: All steaming and cooking times are estimates and can vary by the amount of product and the steam generated from your steaming pot. The amount of time you are able to hold a product is estimated and may vary; it is a good idea to use all seafood products as quickly as possible to ensure its quality freshness. The food handling guide is a list of generally accepted practices of the seafood industry and further information can be obtained through your local department of health.